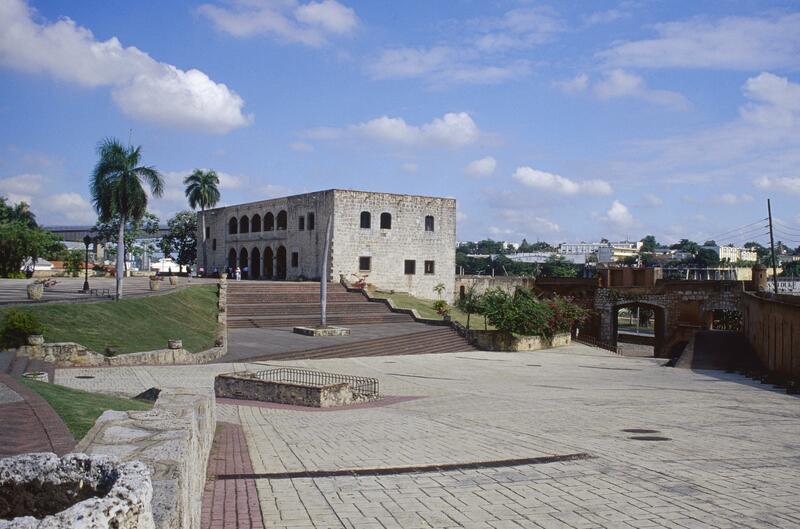 This building, a palace built for the son of Christopher Columbus, occupies a large and visible site overlooking the Ozama river, and would have been one of the city’s most visually prominent buildings in the colonial period. Through architectural statements like this one, elites made their social place known to a larger public. 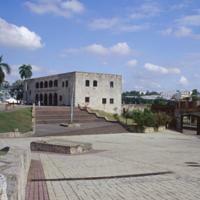 To the right in this image, the Ozama river flows inland from the port of Santo Domingo along here. The gateway at right led into the compound from the city wall. The flat carving of its exterior decoration is typical of Plateresque architecture, a style popular in 15th century Spain. The building itself has a limited number of windows, adding to its fortress-like appearance.